Powers/Abilities: An expert in explosive devices, Bombshell is also an accomplished juggler, using mostly lit bombs and hand grenades. She has used wrist-launchers to hurl her bombs, and was briefly genetically modified to create explosions with her hands. (Hawkeye I#3 (fb) - BTS) - An expert in explosives, Bombshell was hired by Crossfire to kill Hawkeye (Clint Barton), who was teamed with Mockingbird. Bombshell was teamed with Oddball. She planted an explosive in Mockingbird's apartment to kill both heroes. (Hawkeye I#3) - Oddball and Bombshell waited for Hawkeye and Mockingbird to enter the apartment and watched it explode. They soon learned that the heroes somehow survived. They later lured the duo into a trap by tossing a ball at Hawkeye in the subway tunnel. Bombshell, dressed as a nun, hit Mockingbird with her wrist-bomb launcher. She changed into her costume just before Mockingbird attacked, kicking Bombshell in the face before Bombshell took her down with another blast. Just as Hawkeye nearly defeated Oddball, Bombshell hit the hero with a small explosive. They took Hawkeye and Mockingbird back to Crossfire. (Hawkeye I#4) - Mockingbird and Hawkeye were held in restraints in a specialized room while Crossfire explained his plan to use sonics to drive them into fighting each other. They watched the two heroes savagely battle until they were both unconscious. Wearing ear plugs, Oddball and Bombshell retrieved the bodies, but Hawkeye was still awake. He grabbed two of Oddball's balls and knocked both villains out. They were soon arrested along with Crossfire. (Official Handbook of the Marvel Universe Deluxe Edition#3) - Tenpin bailed Oddball and Bombshell out of prison. Oddball, presumably to win Bombshell's affections, taught her how to juggle and she soon became accomplished at it. (Captain America I#317 (fb) - BTS) - Oddball and Bombshell decided to join a team of evil jugglers, each specializing in a particular weapon. Oddball continued wielding his arsenal of deadly balls; Bombshell focused on juggling lit bombs and explosive devices; Knickknack took to juggling blades, chainsaws, and bricks; Tenpin, Oddball's brother, juggled burning bowling pins; and Ringleader, who called himself the leader of the group, juggled razor sharp rings. Calling themselves the Death-Throws, the deadly jugglers started taking contracts out for various kills and assignments. Oddball heard from Crossfire that he would pay the team handsomely if they rescued him from the police before the trial. (Captain America I#317) - The Death-Throws waited for Crossfire, who was being escorted into the courthouse by the police. They threw gas bombs at the crowd and hit the cops with tossed weapons. As the crowd choked, the jugglers donned gas masks and gave one to Crossfire, easily escaping with him and blowing up a cop car on their way out. When they arrived back at their warehouse headquarters, the Death-Throws realized that Crossfire couldn't pay them Furious, they made Crossfire stand in the middle of them as they juggled and tossed deadly devices at each other, which would have killed him if he moved. They decided to use him as bait for Hawkeye, who they figured they could auction off to the Avengers. The Death-Throws set traps at an abandoned railroad station and sent a message to Hawkeye through Captain America's hotline. Hawkeye soon entered with Captain America's shield and they nearly trapped him under a steel mesh net, but Captain America entered and fired flare arrows, lighting the room up and giving Hawkeye time to escape. The Death-Throws attacked, throwing their various weapons. Bombshell was taken down by an arrow from Hawkeye. The Death-Throws were soon defeated and delivered to the police. (Avengers Spotlight#25 (fb) - BTS) - Crossfire hired several villains, including Bobcat, the Brothers Grimm, the Bullet Biker, Mad Dog, Razor-Fist, and the Death-Throws, offering a bounty if they brought him the severed arm of Hawkeye. (Avengers Spotlight#23) - Hawkeye, wounded and running from other opponents, was attacked by the Death-Throws, who surrounded him, each juggling their deadly arsenal. Oddball hit Hawkeye in the ribs with a ball just before the hero climbed quickly up a telephone pole to escape. He shot an arrow at one of Bombshell's bombs and escaped in the subsequent explosion. (Avengers Spotlight#24) - The Death-Throws soon joined Crossfire and the others in surrounding Hawkeye in the sewer. (Avengers Spotlight#25) - Crossfire ordered Hawkeye's arm severed. As the villains moved in, Mockingbird and Trickshot joined Hawkeye, and they fought the villains off, disarming the Death-Throws with their arrows and staves while Hawkeye kept dodging their tossed weapons. In minutes, all the villains were defeated. (Captain America I#392 (fb) - BTS) - Bombshell got genetically modified to be able to cause explosions with her hands. (Captain America I#389) - Invited by Superia to a cruise ship alongside dozens of other female super-villains, Bombshell was given a hundred thousand dollars to hear a proposal of an all female alliance as the Femizons. Bombshell attended a power pageant until they realized Captain America and Paladin were there. The woman all rushed in to attack. (Captain America I#390) - Both men were swiftly captured and taken to Superia. (Captain America I#391) - Superia explained her plans for the Femizons, including sterilizing all men. (Captain America I#392) - Bombshell, Arclight, Mysteria, and Wrangler attacked Captain America, who was wearing a different costume. Bombshell was hit by the hero and her hands hit Arclight, exploding. When Mysteria filled the area with mists, Bombshell fumbled to find Cap. Her leg gave out when Mysteria's rod shocked her, then her hands exploded again when she hit the ground, knocking her out. (Spectacular Spider-Man Annual#12) - Justin Hammer hired Bombshell along with Rhino, Hydro-Man, Beetle, Speed Demon, Stiletto, Constrictor, Blacklash, and Discus, to fight Spider-Man and the New Warriors (Firestar, Namorita, Night Thrasher, Nova, Silhouette). (Web of Spider-Man Annual#8) - Bombshell, Stiletto, and Rhino attacked Spider-Man and Silhouette. When Stiletto's eyes were covered by Spider-Man's webs, he fired his blades blindly, but Bombshell blocked them. She then tossed a grenade at Silhouette, who easily evaded it and then hit Bombshell on the head with a crutch. Recovering, Bombshell threw an incendiary grenade, wiping out the shadows and allowing Rhino to take down Silhouette. Bombshell tossed grenades at Spider-Man while Rhino escaped with Silhouette, but Spider-Man evaded her blasts and webbed a tossed grenade up near her, causing her to get caught in the explosion. In a full battle later, Bombshell blinded Firestar with blasts while Blacklash ensnared the heroine with his whip. (New Warriors Annual#2) - The Sphinx ordered Bombshell, Rhino, Constrictor, Speed Demon, Stiletto, and Blacklash to attack Spider-Man and the New Warriors. When the Sphinx started going power mad, however, the villains panicked and fled. (Captain America I#411) - Bombshell traveled to the AIM Weapons Expo on Boca Caliente. Later, she watched, alongside dozens of other criminals, a bout between "Crossbones" and Mad Dog, Ramrod and Sumo. (Captain America I#412-414) - The fight continued against Razor-Fist (Douglas Scott) and Batroc the Leaper before Captain America was exposed. The villains rushed to attack, but were fought off by Captain America and his allies, Falcon, Shang-Chi, and Diamondback (Rachel Leighton). (Union Jack II#1) - RAID hired the Death-Throws (Bombshell, Knickknack, a new Oddball, Ringleader, Tenpin), who were now being led by Crossfire, to engage in terrorist attacks on London. (Union Jack II#2) - While attacking the Tower Bridge, the Death-Throws were hit by Sabra, who quickly nailed Tenpin. Sabra stayed out of Crossfire's mind control range, though he nearly grazed her with a bullet. Knickknack and Ringleader were prepared to attack her, but Union Jack drove a flying car into them, knocking them into the river. Bombshell, back to using lit bombs, hit Union Jack with an exploding bomb, but he jumped on the flying Sabra's back. They easily defeated Oddball and Crossfire with punches, then convinced Bombshell to surrender her back of bombs. (Dark Reign Files) - Quasimodo researched the Death-Throws, including Bombshell, for Norman Osborn. (Villains for Hire#1 (fb) – BTS) – Misty Knight hired Tiger Shark, Bombshell, Nightshade, and Crossfire to work for her, countering a group of Purple Man and Headhunter’s assassins. (Villains for Hire#1) – After Shocker, Avalanche, and the new female Death-Stalker, in the employ of Purple Man and Headhunter, stole an armored truck full of police evidence, Misty Knight sent her team in to stop them. Death-Stalker was briefly seemingly killed and Nightshade’s helicopter exploded (she was okay since she was an LMD); Bombshell’s explosion sent Avalanche to the hospital. Tiger Shark retrieved the truck and returned it to Misty Knight, learning it had access to the Maggia’s offshore bank accounts. (Villains for Hire#2) – The two sides continued to battle. Purple Man hired Bushmaster and Monster while Misty Knight hired Lady Stilt-Man and Speed Demon. Bombshell, Crossfire, and Lady Stilt-Man battled Death-Stalker and Bushmaster, but Speed Demon escaped with the targeted Adamantium chips. At the Bar With No Name, Headhunter and Shocker (who briefly got in a bar fight) paid Tiger Shark and Bombshell to give them the intel they had, though they couldn’t identify Misty. (Villains for Hire#3) – Purple Man sent Tiger Shark, Shocker, Avalanche, Monster, Bombshell, Scourge, Death-Stalker, and Bushmaster to Misty’s headquarters, where Lady Stilt-Man, Crossfire, Speed Demon, and the new Man-Ape. During the massive fight, they convinced Lady Stilt-Man and Man-Ape to join Purple Man’s side; Crossfire was shot down, and Tiger Shark savagely ripped off Misty’s cybernetic arm. Purple Man and Headhunter revealed themselves just as they learned Puppet Master was behind Misty’s actions. (Villains for Hire#4) – Puppet Master briefly asserted control of the villains, but Purple Man and Headhunter countered them. The villains savagely battled and Bombshell fled, blowing up the tunnel behind her. (Loki: Agent of Asgard#8) - Bombshell joined the Death-Throws, led by Ringleader, in a heist at the Big Top Casino in Las Vegas. They were thwarted by Loki when he hit a knockout gas ball tossed by Oddball back at them, leaving the Death-Throws behind unconscious for the authorities to pick up. Comments: Created by Mark Gruenwald and Danny Bulanadi. 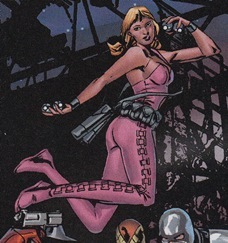 Bombshell received an entry with the Death-Throws in Official Handbook of the Marvel Universe Deluxe Edition#3. Thank you to John Kaminski and Prime Eternal for help with the Annuals in this entry.